Le dernier standard produit par le PEROU (pays qui détient le standard de la race) date du 13.08.2013. Il n'a pas encore été traduit en français. En voici donc la version anglaise. TRANSLATION: Brígida Nestler. Technical Supervision: Miguel Ángel Martínez. FCI-CLASSIFICATION: Group 5 Spitz and primitive type. Section 6 Dogs of primitive type. PREAMBLE: These dogs have been kept as a peculiarity because of their genetic nature, the procreation of dogs with and without hair in the same litter. 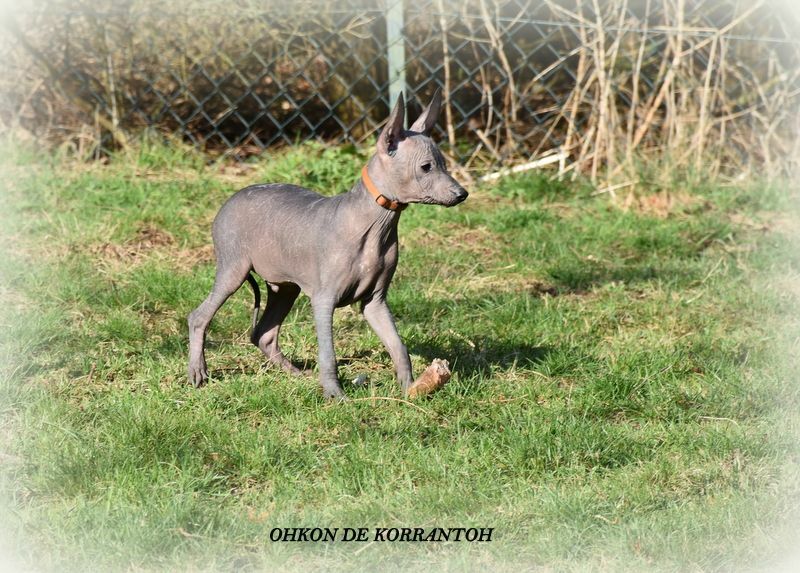 Lost in the darkness of time the naked variety reached a major milestone when it was officially recognized as a breed native to Peru in 1985, during the ordinary Assembly of the FCI at Amsterdam city, thanks to the initiative of the Cynologist Ermanno Maniero, who did the first breed standard, it was possible that this was registered as a new breed under the name of Peruvian Hairless Dog with the number 310 of the nomenclature. 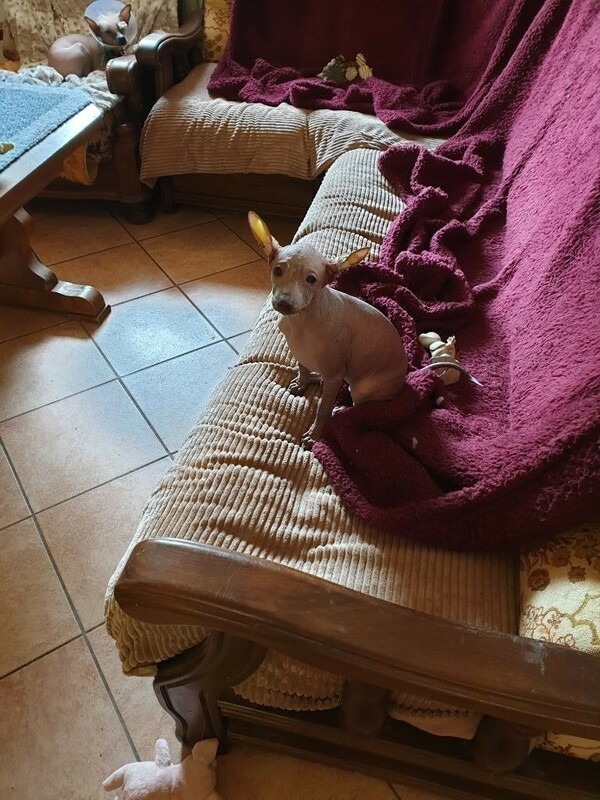 The recognition of the hairless dog did not eradicate the coated relative into oblivion. 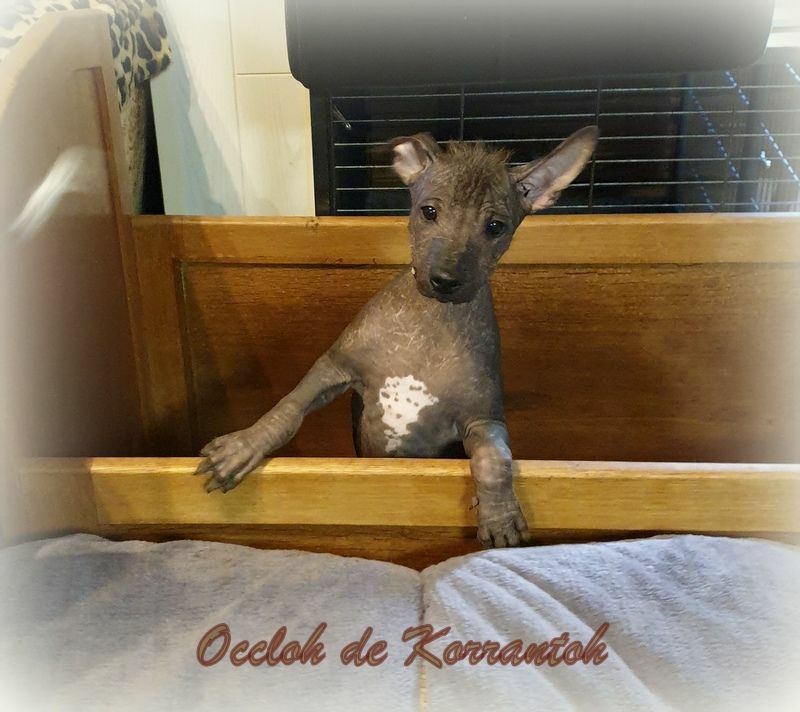 Disdained from any breeding program, its current recognition in the light of developments in the study of its genome emphasizes the genetic value of the breed and contributes to its development and preservation. The recognition of the coated variety, for show and for breeding, favours the expansion of genetic variability, improving the breed’s strength and attracts new breeders. 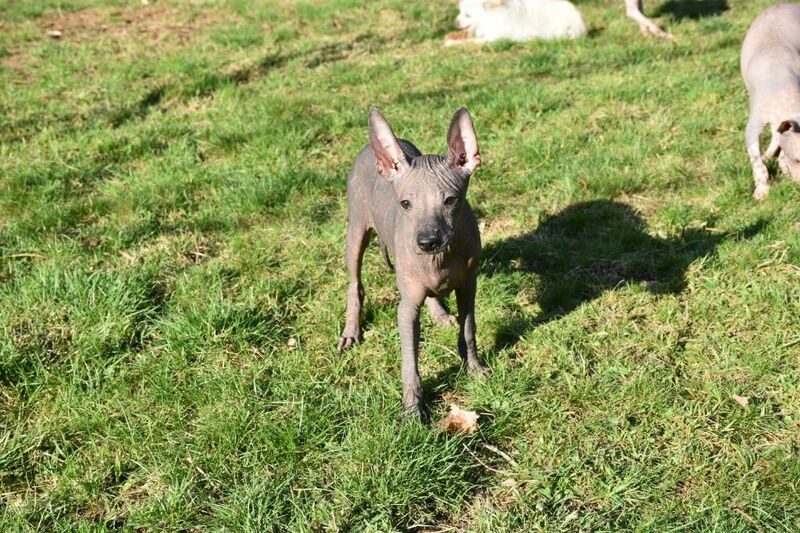 Initially to be registered, the coated variety must be the product of two hairless dogs duly registered in a stud book or breeding record. 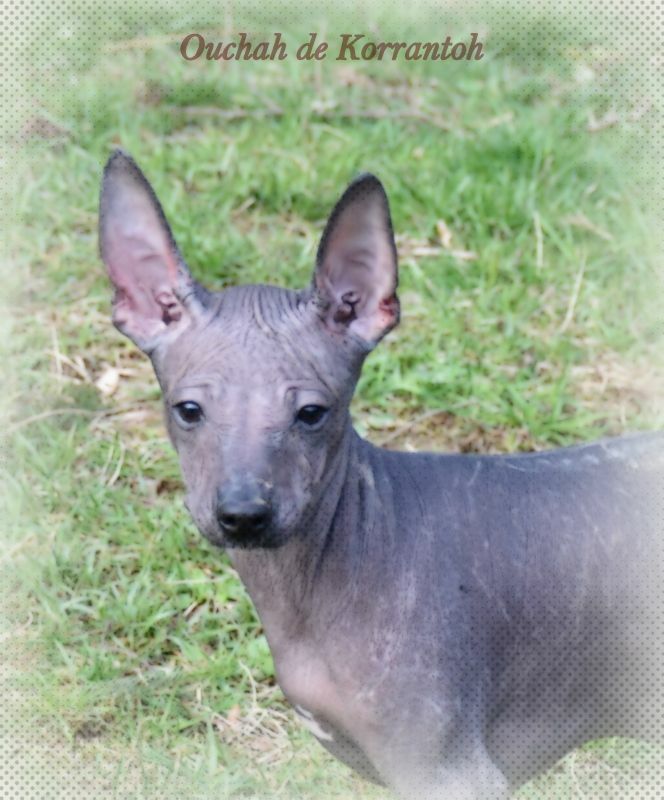 The coated variety can only be mated to a hairless specimen of the breed and subsequently also for generations to come. The mating between coated specimens is banned, just like the registrations of these in any studbooks without duly registered parents. BEHAVIOUR/TEMPERAMENT: Noble and affectionate at home with those close to him, at the same time lively and alert; he might be wary of strangers and is a good watch dog. Nose: Good pigmentation, the colour of the nose must be in harmony with the different colours of the skin; in the different shades in the hairless variety and with the colour of the hair in the coated variety. Muzzle: Seen in profile, the nasal bridge is straight. Lips: They must be as tight as possible and close to the gums. Eyes: Alert and intelligent expression. The eyes must be of average dimensions, slightly almond shaped, neither deep-set nor prominent, normally and regularly placed, i.e. neither too close together nor too wide apart. The colour can vary from black, going through all shades of brown to yellow, in harmony with the skin colour in the naked variety and with the coat in the variety with hair. In any case, both eyes must be of the same colour. The colour of the eyelids may go from black to pink in subjects with light coloured face. The light pink colours are admitted but not sought after. Ears: The ears must be pricked when the dog is attentive, whereas at rest, they are laid towards the back. The ears are of medium length; broad at the base, tapering progressively towards the tip, ending almost pointed. The ear set starts on the upper part of the skull to end laterally and obliquely. In erect position, the axes of the ears form a variable angle from 50° to near 90°. Length: Approximately the same length as the head. Topline: Level, although certain subjects show a dorsal-lumbar convexity, which disappears at croup, level. Back: Straight, with well-developed back muscles often forming all along the back a muscular bi-convexity, which extends to the lumbar region. Loin: Strong and well-muscled. Its length reaches approximately 1/5 of the height at the withers. Croup: The superior profile is slightly convex, slanting approximately 40° to the horizontal. Solid and well-muscled giving a good push. Chest: Seen from the front, the chest must have good amplitude, but without excess; reaching almost to the elbow. The ribs must be slightly sprung, never flat. The chest, measured behind the elbows, must exceed the height at the withers with approximately 18%. Underline and belly: The lower profile presents an elegant and well-marked line which goes from the lower part of the chest and rising to the belly which must be well tucked up, but without excess. FOREQUARTERS: Well united with the body, seen from the front they are perfectly upright with the elbows not turned out. The angle at the shoulder/upper arm varies between 100° and 120°. Seen in profile, the angle is 15° to 20°. Forefeet: Are semi-long and look like hare-feet. The pads are strong and heat-resistant. The inter-digital membranes are well developed. The black dogs have preferably black nails and the lighter coloured dogs light nails. HINDQUARTERS: The muscles are rounded and elastic. The curve of the buttocks is well marked. The coxal-femoral angle varies between 120° and 130°. The femoral-tibial angle must be of 140°. Seen from behind the hindquarters must be upright. Hind feet: Same as forefeet. GAIT / MOVEMENT: Due to the angulations defined at the description of the limbs, some of these dogs move with shorter steps but faster and at the same time quite soft and flexible. The limbs, seen from front or behind must move in a single line (i.e. single tracking). SKIN: The skin must be smooth and elastic all over the body, but can form a few rounded almost concentric lines on the head and round the eyes and the cheeks in the hairless variety. 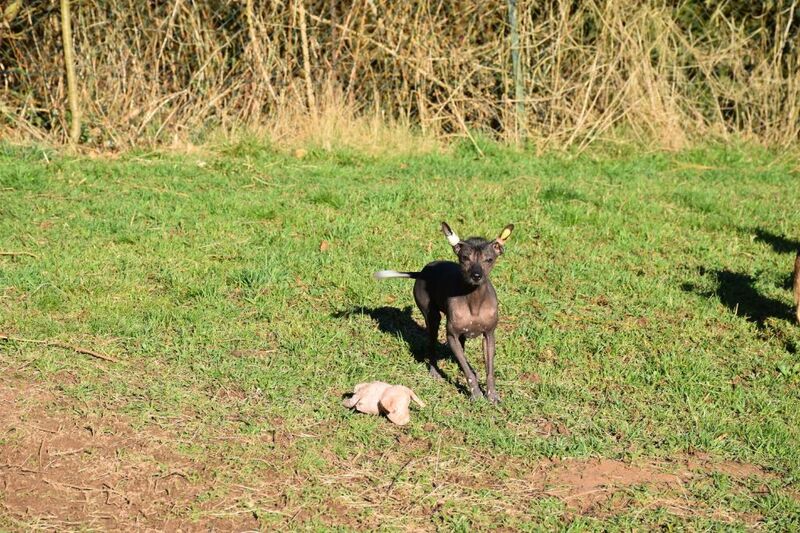 It has been verified that the internal and external temperature of the hairless dogs is exactly the same as that of other breeds (coated or not). The absence of hair leads to an immediate and direct emanation of heat, different from the coated subjects, where the heat filters through the coat by natural ventilation. 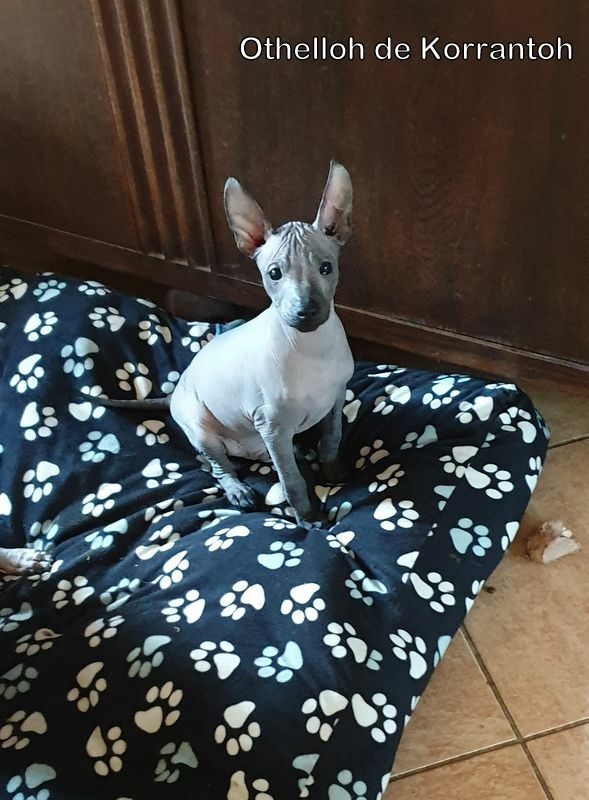 The colour of the skin in the hairless variety can vary from black, slate black, elephant black, bluish black, the whole scale of greys (diluted black), all nuances of genetic blue, dark brown going to light blond. All colours can be either uniform or show pinkish or white patches on all parts of the body. White or pink spots must not cover more than 1/3 of the body. Solid colours are preferred. 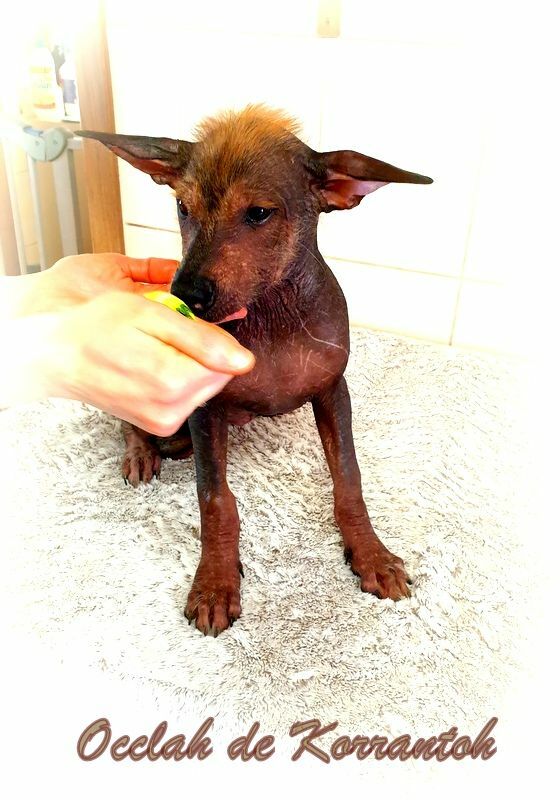 Hairless variety: Without hair, only very few hairs on the head and at the extremities of the legs and the tail are admitted, and sometimes sparse hair on the back. These hairs can be any colour or combination of colours. Semi-erect ears, one or both. More than one teeth missing in the coated variety. Tongue normally hanging outside of the mouth (paralyzed).